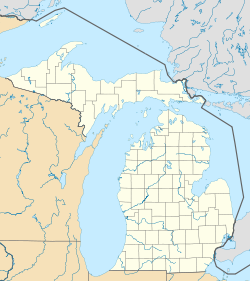 Macomb Township is a general law Township in Macomb County in the U.S. state of Michigan, and a part of Metro Detroit. The population was 50,478 at the 2000 census, with an estimated population of 72,220 as of the 2008 census bureau estimate, making it Michigan's fastest growing major municipality. The early founders of Macomb Township arrived in the early 19th century in search of flat and fertile farmland, like that near the Clinton River. Many of these early settlers were of German descent, and the German influences remain today. The Township of Macomb was officially approved by the Legislative Council on March 7, 1834. The township was named in honor of General Alexander Macomb, who was a highly decorated veteran of the War of 1812; his successful mercantile family owned most of Macomb County at one time. Macomb Township was also a large part of the lumber and logging industry of Southeast Michigan in the late 19th century and early 20th century. Logs would be transported south from Wolcott Mill in Ray Township, down the Middle Branch Clinton River to sawmills. This route became known as Romeo Plank, and is the name of the modern-day road that runs down the same route. Macomb is an unincorporated community in the northwest part of the township at 42°42′03″N 82°57′33″W﻿ / ﻿42.70083, -82.95917 on the Romeo Plank Road near the Middle Branch of the Clinton River. Waldenburg is an unincorporated community in the central portion of the township at 42°39′26″N 82°56′15″W﻿ / ﻿42.65722, -82.9375, a few miles south of Macomb on the Romeo Plank Road and the Clinton River, chiefly in the 22 Mile Road area. Meade is an unincorporated community in the northeast portion of the township at 42°43′03″N 82°52′26″W﻿ / ﻿42.7175, -82.87389 on the boundary with Ray Township at 26 Mile Road and North Avenue. According to the United States Census Bureau, the township has a total area of 36.3 square miles (94.0 km²), of which, 36.3 square miles (93.9 km²) of it is land and 0.04 square miles (0.1 km²) of it (0.06%) is water. The area is predominantly mixed of flat fertile land and swampy wetland, but as of the housing boom since the late 90s, the area has been largely suburbanizing over the last few years. As of the census of 2000, there were 50,478 people, 16,946 households, and 14,065 families residing in the township. The population density was 1,391.7 per square mile (537.3/km²). There were 17,922 housing units at an average density of 494.1 per square mile (190.8/km²). The racial makeup of the township was 96.12% White, 0.84% African American, 0.19% Native American, 1.41% Asian, 0.01% Pacific Islander, 0.31% from other races, and 1.12% from two or more races. Hispanic or Latino of any race were 1.46% of the population. There were 16,946 households out of which 45.3% had children under the age of 18 living with them, 73.7% were married couples living together, 6.5% had a female householder with no husband present, and 17.0% were non-families. 13.7% of all households were made up of individuals and 3.9% had someone living alone who was 65 years of age or older. The average household size was 2.97 and the average family size was 3.30. In the township the population was spread out with 30.2% under the age of 18, 6.9% from 18 to 24, 35.1% from 25 to 44, 20.3% from 45 to 64, and 7.4% who were 65 years of age or older. The median age was 34 years. For every 100 females there were 99.6 males. For every 100 females age 18 and over, there were 97.3 males. The median income for a household in the township was $72,319, and the median income for a family was $78,840. Males had a median income of $59,206 versus $32,232 for females. The per capita income for the township was $25,907. About 1.2% of families and 2.1% of the population were below the poverty line, including 2.2% of those under age 18 and 3.8% of those age 65 or over. According to a 2006 estimate, the median income for a household in the township was $84,901, and the median income for a family was $88,458. Masiela Lusha - Albanian-American actress and writer, lived here when she was young. She was born in Tirana, Albania. Eminem - rapper, currently resides in Macomb Township. Bob Learn, Jr. - professional ten-pin bowler and 5-time champion on the PBA Tour; born in Erie, PA and now lives in Macomb Township. Nathan Miller - former secretary to Fidel Castro. Residents of Macomb Township live within one of four K-12 school districts: L'Anse Creuse, Chippewa Valley, New Haven or Utica Community Schools. One private high school, Lutheran High School North, is also in Macomb Township, while a second, Austin Catholic Academy  is scheduled to open in the future. The International Academy of Macomb (IAM) is a public, tuition-free high school open to applicants residing or enrolled in 18 Macomb County Districts, including Chippewa Valley and L'Anse Creuse. As of January 2009, students residing in the Utica Community School District are not eligible to apply or attend IAM as the district has elected not to participate in the program. IAM opened in the fall of 2008, and offers accepted students a rigorous curriculum which earns an International Baccalaureate Diploma. The Academy, which is located on the Chippewa Valley High School campus, will start with 125 ninth grade students. Each year, IAM will add a grade until reaching a capacity of 500 students, grades 9-12, in 2011. Macomb Township experienced significant growth during the period of 2000-2008, boasting a 48% increase in population. With nearly 75,000 residents, it is considered one of the fastest growing communities in Michigan. The regional newspapers serving all of southeastern Michigan include the Detroit News and Detroit Free Press. This page uses content from the English language Wikipedia. The original content was at Macomb Township, Michigan. The list of authors can be seen in the page history. As with this Familypedia wiki, the content of Wikipedia is available under the Creative Commons License.